In the wake the waning Jupiter quincunx to the US progressed Pallas, we now have a fifth scandal: CNN has blackmailed a right-wing meme-producer into an apology, and half of the political internet is frothing in (arguably righteous) frenzy. Jupiter-to-Pallas transits are astrological triggers for ethics scandals. Under these transits, the innocent have nothing to fear but the unethical run the risk of public exposure. Transiting Jupiter opposite CNN Pallas: ethics scandal. Transiting Saturn conjunct CNN Second House Neptune: a struggle with CNN's primary asset -- its public image. 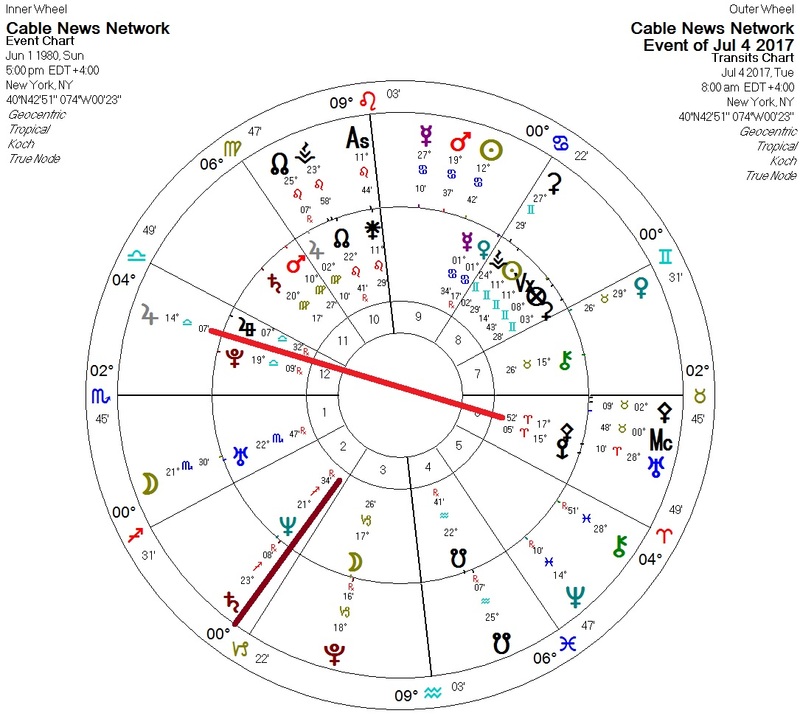 Note that the CNN chart (inner wheel above) has Pallas opposite Pluto and sesquiquadrate Jupiter (very significant ethics problems) and Neptune square the Third House ruler Saturn (a tendency to deception). I have mixed feelings about conservatism and Donald Trump, but love to see justice done.